In the world of online casino, there are many games which share similar themes: underwater-themed slots; fruit-themed slots; royal-themed slots; fairy-tale-themed slots and animal-themed slots – to name a few! 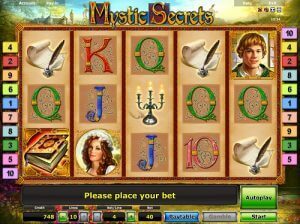 However, you’ll be hard-pressed to find a game with as unique a theme as Mystic Secrets. This slot game is truly unique and truly divine. Mystic Secrets draws its inspiration from English churches and their unique décor and traditions. For anyone who regularly attends church or who would like to know more about the traditions and ornamentation, this is the slot for you. Fans of our other slots, such as: Royal Dynasty, Cindereela and Kingdom of Legends will enjoy this slot too. The lower-paying symbols are card values from 10 through to Ace and even these are beautifully decorated using the art of calligraphy. The higher-paying symbols include a chalice, a candlestick, some parchment and a quill and a young man and woman from the congregation. Like many other slot games, the aim of the game is to spin at least three matching symbols on an active payline, in consecutive reels from left to right. As you can see from the background, this slot is not just about religion, it’s also about history. The church in the background looks rather medieval, as do the characters who grace the reels and you can also tell by the parchment and quill! What’s not medieval about this slot, however, are the features. Firstly, you can put the game into autoplay mode which allows the reels to spin for themselves, without you having to lift a finger – now, we bet there was nothing like that around in the middle ages! What’s more, you can gamble your wins in this game. All you have to do is click ‘gamble’ after you get a payout and you’ll be taken to another screen with a deck of beautifully decorated cards. Guess whether you think the next card to be revealed will be red or black – get it wrong and you’ll lose your win, but get it right and you’ll double it, with the chance of doing so again and again! Another great thing about this medieval, religious-themed slot is the free games it offers players. There are two special symbols in this game: the Scatter and the Wild. The Wild symbol is the vicar himself, standing at the altar of the church, reading the congregation his sermon. He can substitute for all other symbols except the Scatter symbol. The Scatter symbol in Mystic Secrets is a golden book. Whenever you spin three or more Scatter symbols, you’ll be rewarded with a number of free spins! These free spins also come with a ‘Mystic Bonus’! During these free spins, the vicar who is standing at the altar will expand to fill a whole reel and during each spin, there’ll be two of him, each one occupying a whole reel. He still substitutes for other symbols during the free games, so having him fill two whole reels will dramatically increase your chances of getting wins, and big ones at that! It’s always good to have a holy man on your side. If you’ve enjoyed playing this game, why not check out another of our slots? Here at NovomaticCasino.co.uk, we have a massive range for you to choose from, including some very lucrative jackpot slots. These jackpot slots, such as Gemstone Jackpot, are really popular amongst our regular players and can, and often do, pay out life-changing sums of money!